Ngarkat Images: The Hayward household being "tech savvy"
Reviewing the new Sony Tablet S for cnet.com.au has been a very interesting and rewarding exercise for us. As the Sony Tablet utilises the Google “Android” operating system at version 3.2 or “Honeycomb” as Google likes to refer to it, and being open source, there is an amazing amount of information available for nerdy types (like me ... hhmnnn) to take advantage of. I like to tinker in the programing side of things where possible. While digging around on the Net I found a cute little device put out by sparkfun.com and that I bought here in Australia from www.littlebirdelectronics.com called the IOIO (or pronounced “yoyo”). To control the IOIO board I have had to load the Android SDK development environment on my Lenovo laptop. With this, Google have chosen to use the very powerful ‘Eclipse’ IDE. Setting up the development environment is not as easy as say the Microsoft Visual Studio development environment for Windows however there are plenty of straight forward instructions available on the Net to guide you, especially if you are familiar at all with cross compiling development platforms. 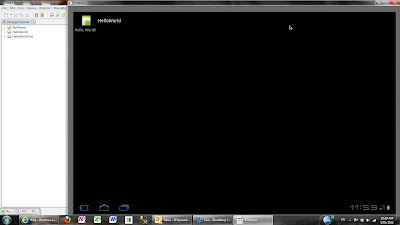 The Android "Eclipse" environment running on my Lenovo laptop. The obligatory "Hello, World" running on my Lenovo laptop.